Halloween is well over, stores already put out their Christmas and Hanukkah goods, and women everywhere are finding every excuse to wear scarves and take Instagram photos with Starbuck's holiday cups. But what about Thanksgiving??? Fall is my favorite time of year and often gets skipped over in favor of the holiday season. 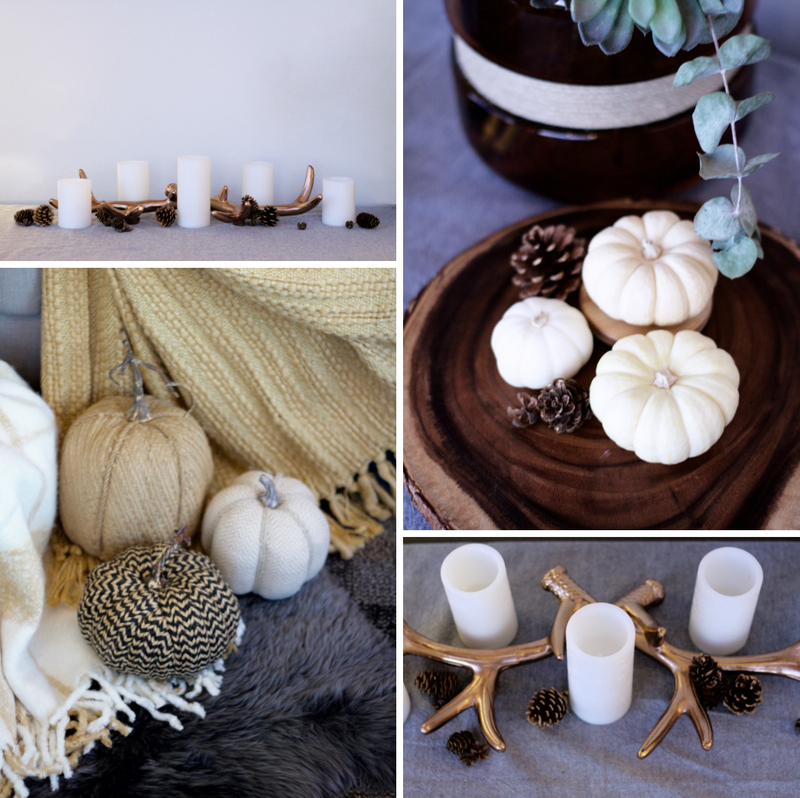 Fortunately, you can easily transition your home from Halloween to Thanksgiving to the holiday season. 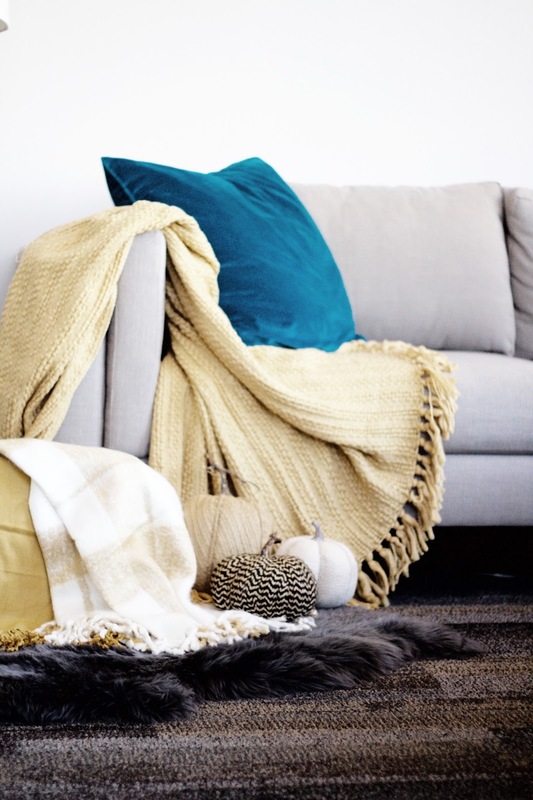 From textural furs or blankets to layering with metallics, there are so many ways to quickly decorate that make a big impact. 1. Add instant coziness with soft, textured blankets and knits. They immediately make you want to snuggle up by a fire. Bonus fall points if they're plaid or in autumnal colors such as mustard, deep reds, or oranges. 2. Layer luxe pieces like fur and velvet to give your space a quick boost of sophistication and fall/winter vibes. These are like the perfect statement necklace for a room. 3. Mix in wood tones and baskets for rustic elements. 4. Easily transition your home between holidays with metallics to add a touch of glam and feel festive. 5. Pumpkin Power! Nothing says, "Fall / Thanksgiving" like pumpkins. You can skip the Halloween Jack-o-lantern style pumpkins and go with their more refined heirloom cousins. They come in all colors but my favorites are the popular gray/blue colors, white, and muted orange. Or-if you'd rather have a really quick, lasting decoration-you can buy fabric covered or textured store bought pumpkins (like those pictured) that you can save to use year after year-no runs to the pumpkin patch necessary. I recommend buying in groups of three to add interest and move the eye around naturally. 6. Leverage nature and incorporate fall's signature apples, pinecones, branches, leaves, or pomegranates. 7. It wouldn't be fall without candles to add a soft glow or seasonal scent. You can also buy battery operated no flame candles for year round use. An extra bonus is you can buy ones with remotes or timers so the candles "light up" and shut off every night without your having to think about them. 8. One of the quickest ways to decorate for Thanksgiving is to get a bouquet of flowers and branches. Arrange them in your favorite vase or pumpkin and amaze friends and family of your domestic powers. 9. 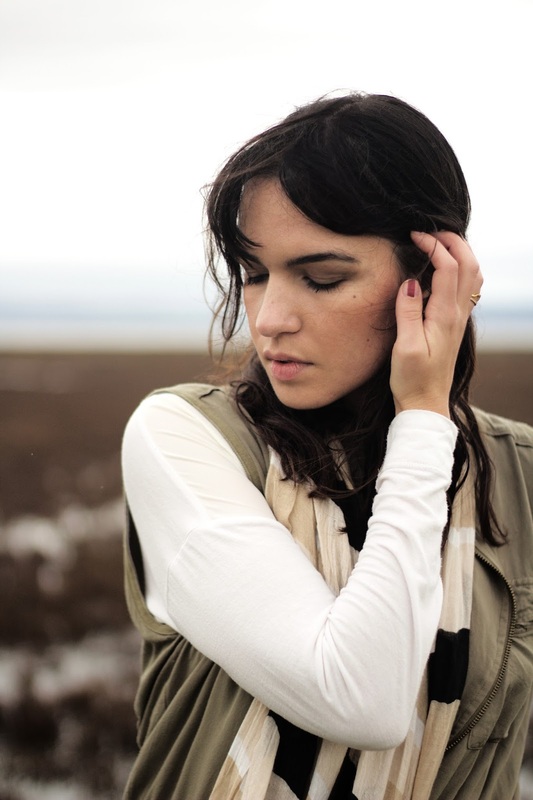 Pick a simple color palette and stick to it. I usually recommend limiting yourself to three colors plus one or two neutrals max. It will have more impact and keep your decor fluid no matter where you put it throughout your home. I selected mustards, grays, and blues with my neutrals being white and metallic copper. 10. Buy items you can easily utilize in your holiday decor as well. It will make it easier on you and your wallet. Things like the pictured copper antlers, candles, and velvet pillows are perfect to feature in both your Thanksgiving and holiday decor and you don't have start over completely as soon as Black Friday hits. 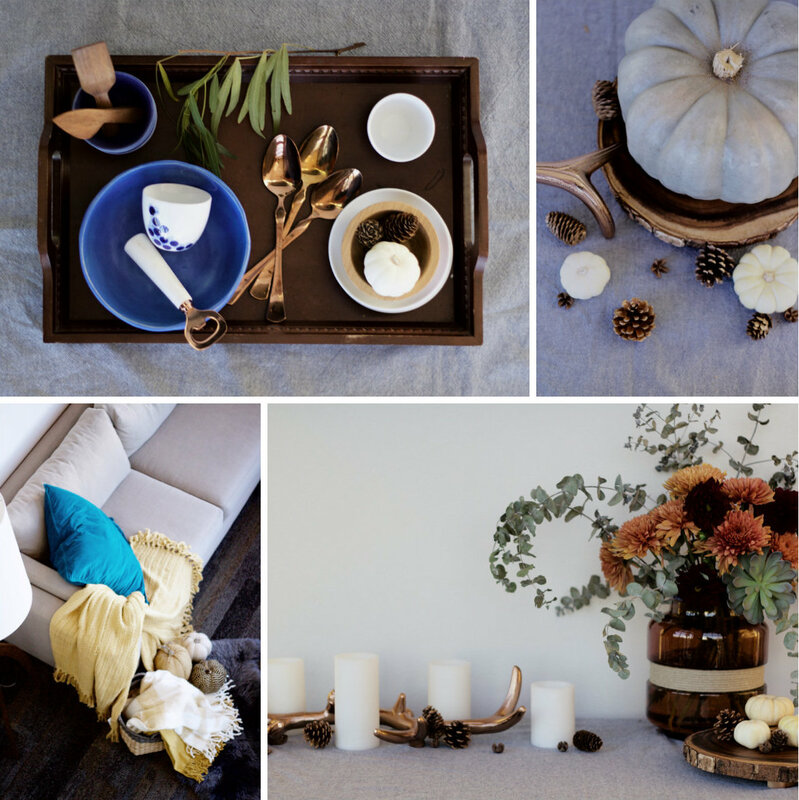 What are some of your favorite ways to decorate for fall / Thanksgiving? Do you decorate for Halloween and Thanksgiving separately? 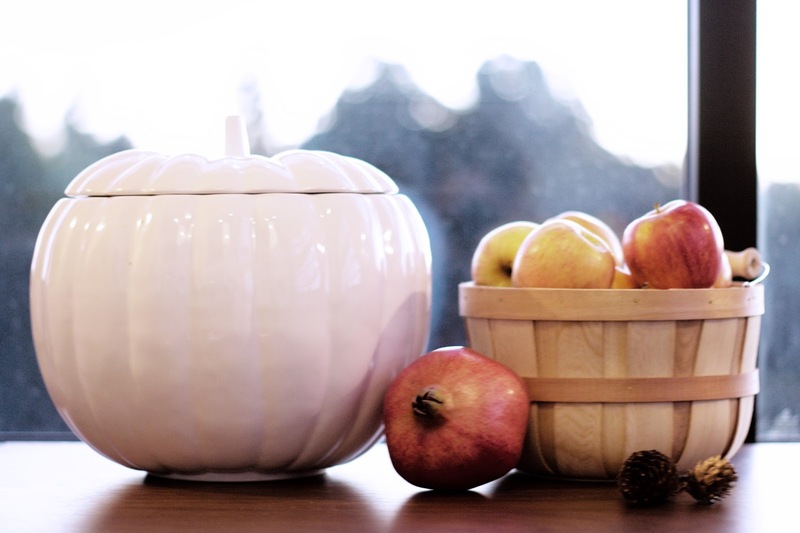 What makes you think "fall" when you see certain decor? Yes! I love what fur can do to "cozy up" a space and make it perfect for fall / winter. :) Sounds like you have a pretty cute place! I love the tips, they are quite simple.